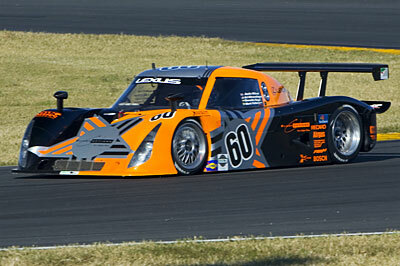 On the track - the #60 Michael Shank Racing Flight Options DP Lexus Riley. 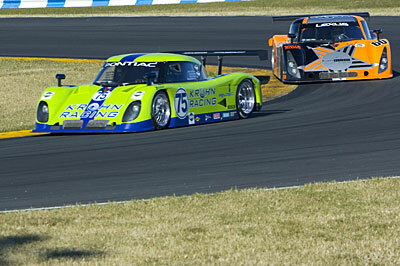 Drivers of record are Mark Patterson, Oswaldo Negri, A J Allmendinger and Justin Wilson. 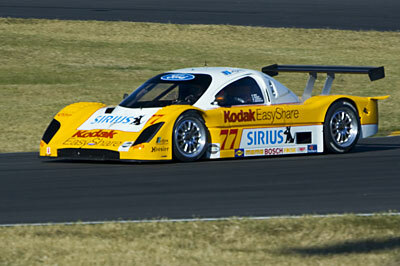 On the track - the #77 Doran Racing Kodak/Feeds the Need entry. On the track - the #65 TRG/F1 Air/Alpine Bagel/iRise GT GTO.R entry followed by the #39 Cheever Racing entry, a DP Lexus Crawford. 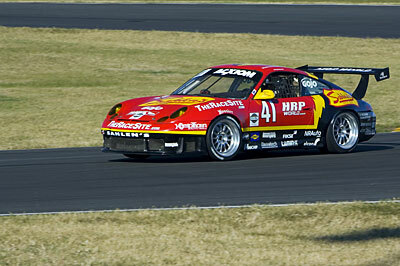 On the track - the #41 Team Sahlen GT Porsche driven by Joe Nonnamaker, Wayne Nonnamaker and Will Nonnamaker - Like many other entries, a family affair! 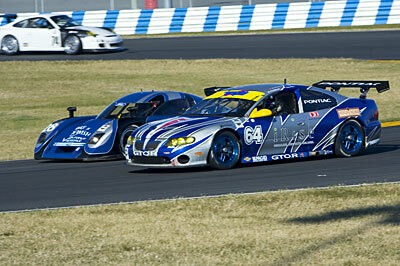 On the track - The #75 Krohn Racing DP Pontiac Riley followed by the #60 Michael Shank Racing Flight Options Lexus Riley. On the track - the #64 TRG/iRise GT Pontiac GTO.R outside the #28 Finlay MotorSports Make a Wish/Z-Line Designs/Air Force Reserve DP Ford Crawford. On the track - bunched up after a restart. 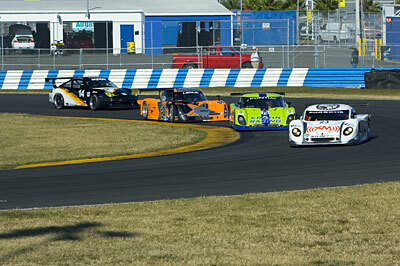 On the track - bunched up after another restart. 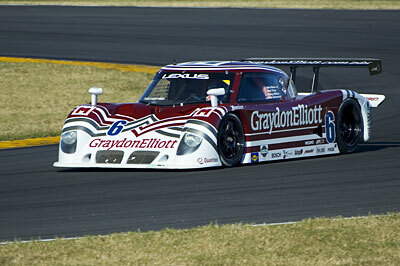 On the track - the #6 Fusion Graydon Elliott Capital/Mears Motor Coach DP Lexus Riley. Drivers are Ken Wilden, Paul Mears Jr, Mike Borkowski and Paul Tracey. 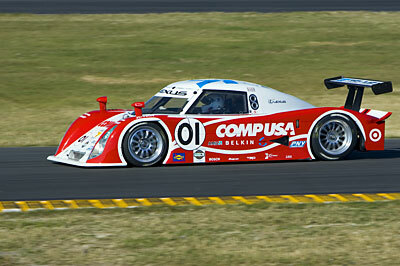 On the track - the #01 CompUSA Chip Ganassi with Felix Sabates DP Lexus Riley. 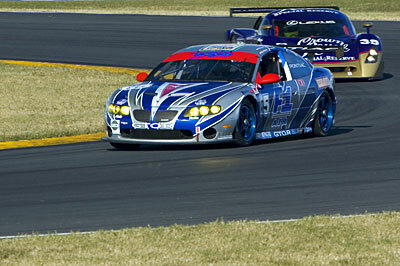 Drivers are Scott Pruett, Luis Diaz and Max Papis. 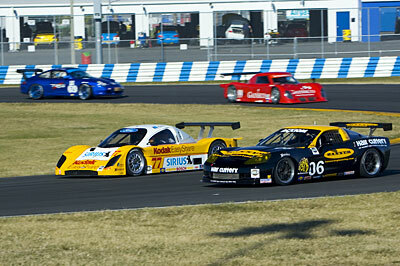 An IROC car - two of 'em were being tested between Rolex test sessions. 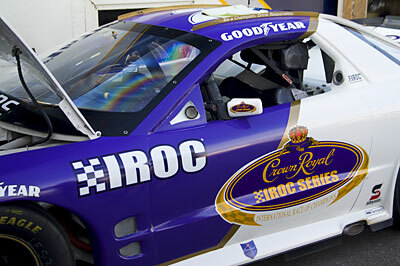 Later this year IROC will run a road course event, the first in 14 years, and at night no less! !